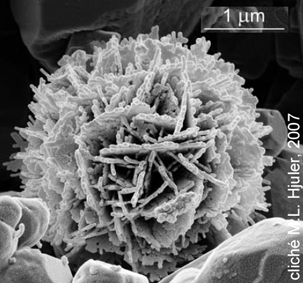 The calcite reacts and tends to disappear what pulls a strong concentration in ions carbonates. 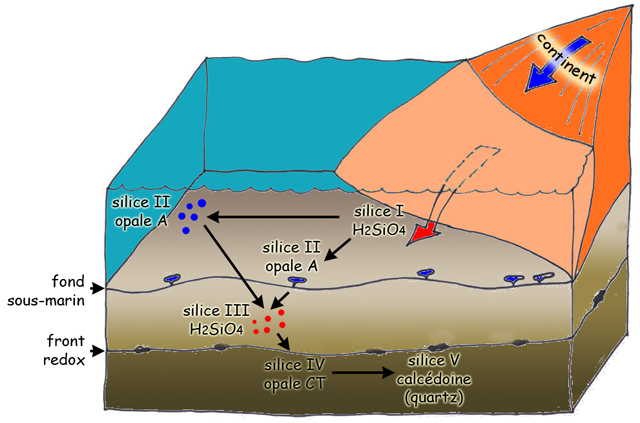 In the continuation, the trained secondary silica, the variety of opal said opal C-T because it is established by an interstratification of cristobalite (C) and of tridymite (T) of low temperature, propagates in the sediment in the form of small crystals lamellaires or of microsphérules about 10 µm called lépisphères. The opal C-T, métastable, is going to evolve during the diagénèse and during the burying. She is transformed into quartz alpha, in passing from a microcrystalline state to a fibrous crystalline state, chalcedony. This transformation takes place only under a load of 50 100 meters away from sediment. It is the general opinion, but some people think that both silicifications (opal CT and chalcedony) come true independently. Chalcedony replaces point by point the calcite of the chalk. The protosilex is so going to get fat and by successive dilations to train a complete bench. Certain flints are hollow because the primary silicification is incomplete. The traffic of the water in the cavity sometimes leads to a dissolution or a haste of secondary silica in the form of chalcedony hillocky in the attractive bluish reflections or still small quartz crystals miming a geode. But why the cyclicité of flints? The reaction removing the calcite for the benefit of the silica at the level of the forehead redox is slow and, in the general case, it does not begin. A balance occurs between the sedimentation on the bottom and the travel of the forehead upward, stabilizing the forehead redox in the same depth in the mud. To break this balance and move the forehead redox downward, it is necessary to change the chemical conditions on the bottom and to increase the potential of oxidation. Such conditions occur if thorough waters grow rich in oxygen, this case which can happen if cold waters, thus containing more dissolved oxygen, are brought by currents. A change in the diet of the thorough currents, on the scale of the pond, is the most likely hypothesis. A strengthening of upwellings bound to a cyclic climatic variation, thus of astronomical origin, is put forward here. These conditions are still favored when the space of accommodation is maximal (high-level Prism, MFS). Certain authors (Lindgreen and al ., on 2001) attribute the acidification of the mud to the increase of the CO2 Atmospheric bound to volcanic eruptions. The strong volcanic activity of ridges also had for consequence to free in the water a strong quantity of That and Si. But these processes do not report the cyclicité of flints, they favor on the other hand their haste. For other authors, Frölich (2006) for example, the training of the flint is autocyclic (just like the water clock), the haste of the flint starting when a certain thickness of chalky mud is sédimentée. But this interpretation does not correspond to the observation on the ground. In particular at the level of hillocks and basins, where we follow individually every level of flint, the thickness of the chalky interbench is very variable. These estimations rest on debatable data, but they go to the sense of a cycle précessionnel. All the chalks do not have the same abundance in flint, some even do not contain it. These variations are at the same time spatial (paléogéographiques) and temporal (stratigraphical). The zones of sedimentation considered as deeper, those where the stratigraphical condensations are rare and the less marked hard-grounds, as centres him Dieppe-Sussex, are less rich in flint. Certain levels as chalks of the limit Cénomanien-Turonien and the beginning of Turonien lack flint. In the first case, we can think that the depth decreases the concentration in dissolved and reduced oxygen the thickness of mud oxyque. In the second case, we can think that climatic effects, modifying the stratification or the oxygenation of seas, as OAE 2 or various pulsations of the OAE 3, block the training of flints.